Were it not for the explosion of interest in the Renault/Singapore scandal, the big news this week would have been the sale of the BMW Sauber team to the Swiss investment company, Qadbak. As a supporter of the team, I am relieved that it will survive (presuming that it will be given a slot in next year's championship) but I cannot help but feel that there are odd aspects to the news. For a start, the speed with which a deal was done is a little surprising when we remember the long months of suspense before the future of the Honda team was decided. Is there something about the BMW team that made it more attractive to interested parties or is it more a case of Honda being deliberately obstructive to buyers while the company waited for Ross Brawn to put together his offer? I am inclined to think it was the latter and that there is nothing unusual in BMW's team being snapped up so quickly. Even so, there is something ironic in the buyer being a Swiss company. Switzerland banned motor racing after Pierre Levegh's terrible accident at Le Mans in the fifties and it has never gone back on that decision. However, there are signs, not least Peter Sauber's admirable efforts and this latest purchase, that there is a growing interest in the sport within the country, in spite of its lack of races. I guess that the facilities at Hinwil had a lot to do with Qadbak's interest anyway. The F1.09 will feature a new front wing, more deeply undercut sidepods, another iteration of the double diffuser and a modified rear wing. The team will also introduce a totally new gearbox. Theissen said: "We are looking forward to the whole show and are aiming to go on the attack with our significantly revised car." Heidfeld added: "I've been looking forward to the race in Singapore for many weeks because I know we have some modifications ready for the weekend. Our simulation work has been very promising and the car will look great." 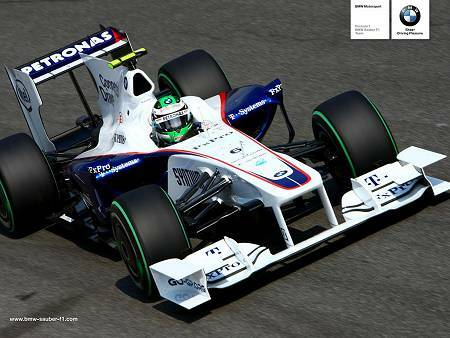 It seems odd to me that BMW should carry on putting money into the team after having decided to get rid of it. The usual reason given for this is that the company wants the team to remain an attractive proposition to potential buyers but I wonder if there is more to it than meets the eye. Dr Theissen himself, ostensibly a company man as their Director of Motor Sport, seems undeterred in his enthusiasm for F1 and it may be that he intends to stay with the team rather than go back to a more general oversight of BMW's many involvements with motor racing. Whatever the reasons for these apparent anomalies, I am glad that the team is looking forward to a robust future in F1. The engine was always the company's main connection with its team and, now that we know this will not be on offer anymore, it becomes much clearer that the team was always Sauber and not truly BMW at all. Reversion to Ferrari engines is merely a matter of picking up where they left off, I think. The possibility of Dr Theissen staying with the team is interesting in that it would show how strongly any engineer is attracted to F1. Competition is fiercer than in any other motor sport, demands greater and rewards more desirable. This is the peak, after all, and success demonstrates superiority in the engineer's chosen field. It is all good news for the team and all that remains is that a slot be found for it in the 2010 season. Whether that comes as a result of withdrawal of another entrant or the expansion of the field to 28 cars, I don't much care. The team is part of F1 now and things would not be the same were it to disappear. My problem with BMW is - I don't like their road cars. Nevertheless, I hope BMW remain. F1 needs a team that can compete. With all the shenanegins it is easy to forget that the major engine manufacturers are actually putting on a show. .. Oh, is anything happening with Pitlane? Been very quiet. Fractal: I'm not crazy about production BMWs either and have always regarded the F1 team as a different creature from the company. The engines were good and the money nice, I suppose, but it was really the old Sauber team with a different badge. To be honest, I haven't looked at Pitlane for a while. Contributions dried up and John seemed to lose interest so there seemed little point in keeping an eye on it. I have no admin rights so cannot attempt to keep it going myself and I warned John from the start that I wouldn't be able to write much for it myself. So I guess we can take it that it has died. A pity, but there we are. I think the reason for BMW's investment is simple: Mario Theissen is a F1 fan and the board had to do something to sweeten the blow of him losing his project. At least Mario and his team can finish their time together in honour (assuming Mario stays with BMW rather than the team, which is not a given). Alianora: Thanks, Ali. You're right - it could well be the board wanting to soften the blow for Theissen and, perhaps, persuade him to stay with the company. I still have my doubts that the all news teams for next year will make it to the grid, so I think there will be space for the team formerly known as BMW-Sauber. The big question is - will Kubica stay with them? Glad to see the team with a buyer without all the Honda drama we saw last year. Still...my wish is that all these manufacturer/owners find a buyer and just do what they do best-supply race engines and build good production cars. This pollutant of unlimited cash for racing teams has sullied the biggest names in racing. Ferrari, McLaren, Piquet, Mosley, Ecclestone, Benneton, Honda and the list goes on. It has made F1 extinct in North America, France and is threatening it on many other fronts. Auto racing survives in many, many places on very small cash rations. In the end the manufacturers have proven what we already know. There is such a thing as, too much of a good thing. Patriotism to huge multinational marques is absurd. Lets all cheer for the Goliaths. The ones that bought or drove away the private entrepreneurs. Once all these rich, heartless companies get out of F1, we hopefully will go back to having a worthy show. Where sound rules are written by sound minds. Where engineers, drivers and owners will act on the knowledge that, to have a race, racing cars must be able to pass one another. BMW were just another corporate flavour of unpalatable ice cream. Not because of WHO they were, but WHAT they were. Part of the great money glut that has changed F1 into the great greedfest it has become. What we have seen over the last long while is a carnival of excess. A no holds barred war! Not a sport. The one thing that we can say about BMW is that they haven't, at least publicly, stooped into the mire of the rest. If the "swine flu" that is running F1 refuses to let go of the rope holding the huge beast they've helped to create, the beast will slim down until it slips from their noose. At this rate we may be back to decency by 2011. Gusto: No, no, I am all for variety. My point is really that any departure from F1 lessens the variation between cars. Vera: I think F1 needs the manufacturers as engine suppliers but I agree in essence with Nick's last comment - they have also introduced huge amounts of money into the sport that have warped it in the end. So yes, let the car makers supply engines and the teams worry about chassis etc. Nick: The good news is that things do seem to be heading back to the way things were. If departing manufacturers can at least hand on their engines to smaller development firms, F1 can continue without manufacturer teams. If, like BMW, they take away their ball by not supplying their engine, the teams could be limited to Ferrari, Cosworth or no engine at all. In time new independent engine developers would arise, however. All the engine variety in the world won't help if the inherent design of a car is such that it cannot be passed, due to aerodynamics and the effect on the trailing air. As things are now, the engines don't mean so much. Maybe the name on the valve cover makes something in the brand-loyalty synapse sparkle, but since the rules are so strict and confining it would surprise me if the innards were all but interchangeable. Those who can get the equation that balances downforce, top speed, reliability, economy and driver preference right are the ones who win races. I would go as far as to guess that the software, and its degree of user friendliness, in the car and pit lane race analysis probably have more effect on the car than the actual engine.